BRING 8 OF YOUR FAVORITE CLASSICS ALONG WITH YOU! Get a handheld dose of gaming history! 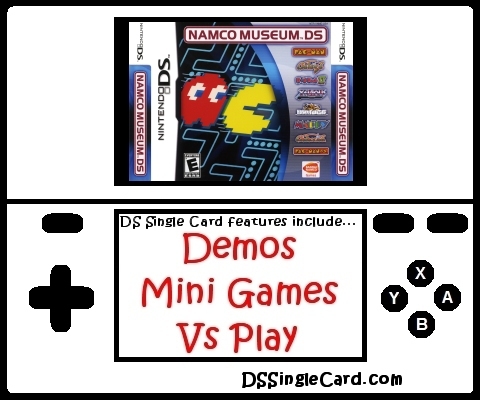 Namco Museum DS gives you a chance to enjoy your favorite classics on your Nintendo DS. Pac-Man Vs.: For the first time even on a handheld, this Pac-Man remake delivers classic gameplay with a twist! Wireless play: Challenge up to 3 of your friends in Pac-Man Vs. Friends can play as ghosts to stop you on your mission to clear the board. Unique viewing style: Use the dual screens as you play to view useful gameplay information.